Go for coffee and a pastry. Go to pick up bread, Go for breakfast or lunch. No reservations. 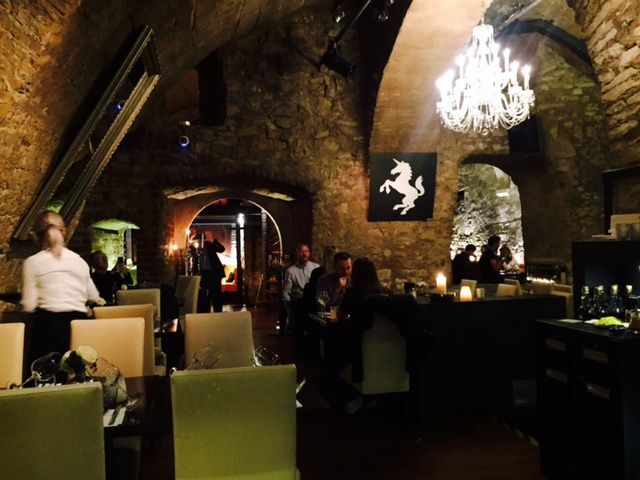 You can tell from the mishmash of tables, chairs, couch and a do-it-yourself glass urn of cucumber water and towers of glasses, that this is a casual, pop-in or meet-someone kind of place. 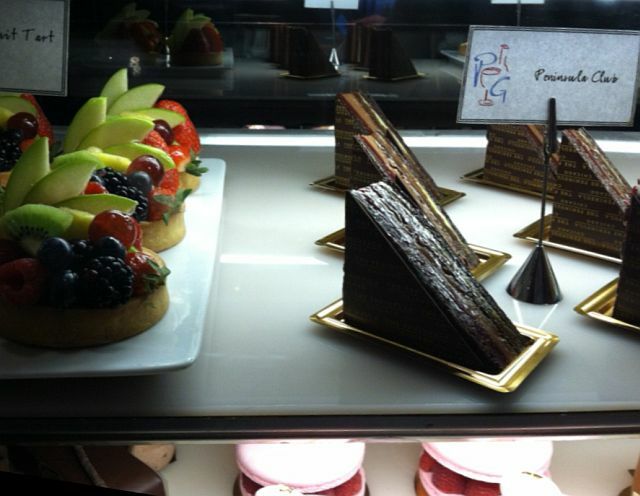 So gaze wonderingly at the pastry case, the bread case and the menu while standing in line. Then order, pay and find a table or do take out. 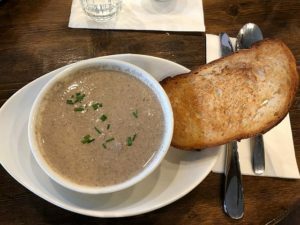 On a recent lunch stop my friend (who is also a food writer) and I both got the mushroom soup. Yum. It came with a toasted bread slice so I asked for butter. That was fine but the bread also tasted wonderful dipped into the rich soup. 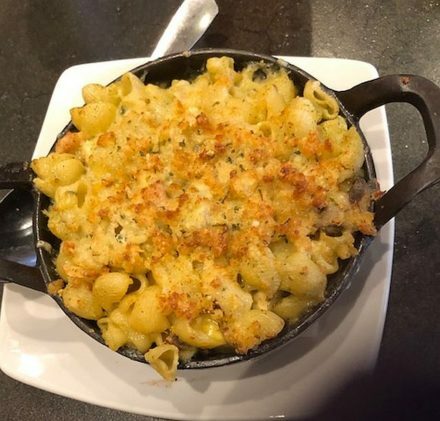 Open in October, the café does change soup specials and other dishes according to the season such as a squash soup in the fall and a cold soup in summer. 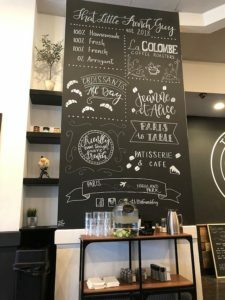 Owned by Ben Levy, That Little French Guy will be closed for Passover but Levy, a Parisian transplant, likes the Chicago suburb and hopes his patisserie and café will be more than just that new place in town that people want to check out. Given that traffic was non-stop the whole time we were there and that people seemed to know the get-in-line, find-a-table drill, guests looked like they were repeat customers. “I always wanted to be a chef,” said Levy who stopped by the table. Asked about what has appeared to be the most popular items ordered. “The café’s soups (no surprise given the weather since he opened and the richness of what we tasted), and the (patisserie’s) “Mademoiselle,” he said. He described the pastry as a large French macaron filled with vanilla cream surrounded by fresh raspberries. But I’m going back to try a chocolate croissant. I was spoiled by the heavenly croissants of Château Frontenac when staying in Quebec on a travel assignment a few years ago. Levy trained in Paris at wo highly regarded patisseries and cafés – Angelina and La Maison Pichard, the first known for gorgeous pastries and the second known, for among other things terrific croissants. Yes! That Little French Guy is at 1791 St. Johns Ave., Highland Park, IL. It is Ccosed Monday. Hours are Tues-Sat, 7 a.m. to 6 p.m. and Sun. 8 am to 4 p.m. For other information call (847) 737-9680 and visit That Little French Guy.